The Indian food industry is witnessing an annual growth rate of 25-30 per cent, aided by the interest of foreign fast food chains that have started to find their calling here. As per a report, 7 percent of total restaurant market comprises of QSRs. If international players like Dominos, Mc Donalds and KFC are ruling the roost, the local thespians are well doing their bit to expand their footprints analogously be it Jumbo King Vada Pav or Nirula’s. Well, whatever it is, the category of QSR is growing aggressively. 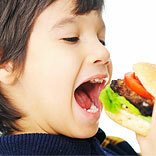 “Indian tradition did not inculcate the habit of fast food in us. But the younger generation started to adopt the habit since the advent of multi-national players in the country which was soon followed by the other age groups as well”, avers Mr. Shashi Khanna, Owner of Angrezi Dhaba. Growths in consumerism, consumption of new cuisines and increasing brand awareness have been the core reasons for the global leaders to enter India. Add to all this, the favoured destinations by way of modern formats like malls, multiplexes and food courts, that have given an impetus to the food business. QSR that started with a bang in big metros are now building their presence in tier 2 cities like Pune, Ahmedabad, Bhubaneswar, Jalandhar, Chandigarh and Bangalore etc. I remember as a small child, I would stand by any hawker to buy Vada Pav and not feel ashamed of the watchful glances of the passersby. Now, if I have to repeat the same, I would think twice and may even compromise my purchase for a good retail experience for reasons like, hygiene, brand, ambience and a unique experience. In short, the key for any QSR to generate interest in the minds of the consumers is an amalgamation of mass appeal, a characteristic ambience, a strong brand identity, excellent service and a unique experience. In short, the perfect environment in a QSR should be fun, friendly and familiar. Khanna shares, “They must deliver what they promise in the sense that the term QSR in itself means quick service and as global leaders like Mc Donalds have spoiled the habits of our consumers by delivering in short time of say 5-7 minutes, so if others don’t follow suit, they will be left behind. Moreover, the target audience of a QSR which is under 30 years is quiet impatient so adhering to global standards is a must in service apart from the quality of food for success”. Organised market has totally swiped off the unorgansied market. To attract the traffic of the unorganised players, they have slashed down the prices to their levels. Mc Donalds and KFC or even Jumbo king for that matter is selling at a bottom price of 10 to 20 Rupees, so why would one not pay a little higher to sit in a good place, get attention, earn a unique experience rather than for a small amount take risk of health, stand on roadside and miss on the experience of a good ambience. QSR market is worth Rs 3000 Cr and the rest in the organised market is at 5,600 crores. Adding both QSR and Fine Dine makes for 20 percent of the total industry whereas the rest 80 percent makes for 34,400 Cr. The two main challenges of a QSR are maintaining consistency in products and quality of service apart from competition, low entry barriers, localisation of menu, standardisation of product across outlets, monitoring multiple outlets, acquiring key talent, managing high attrition towards junior employees, building a cost effective supply chain, monitoring quality of products procured from third parties etc. Mr. Maniish Prem Bajaj of Punjabi Ghasitaram Sweets thinks realistically as he avers, “I think the two major challenges in operation are: The high attrition rate which is 30 to 40 percent more in this Industry in comparison to other Industries is a major problem for QSRs. Another big challenge is pilferage at the counter". Conclusion: There is a vast opportunity in QSRs that are growing at an alarming rate. But the food service operators need to adopt global standards of operations if they do not want to lag behind in comparison to their multi national counterparts.